wePresent helps schools and businesses share, discuss, and contribute by offering the right tools for every situation. 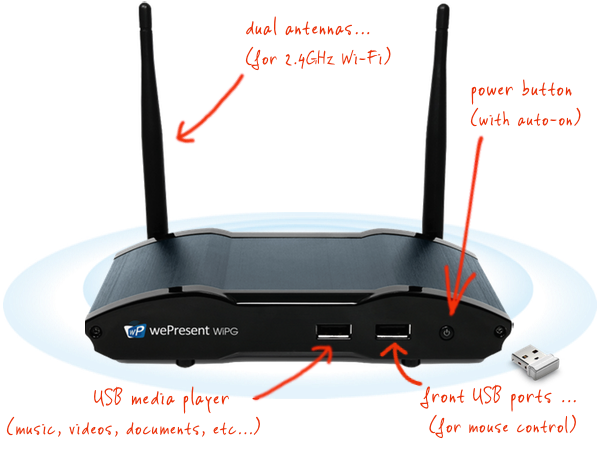 The wePresent wireless presentation system is a true BYOD-enabled classroom technology solution. wePresent offers 3 models to choose from, the WiPG-1000, the WiPG-1600, or the WiPG-2000, plus the all new SharePod for adding any HDMI content into the wePresent environment. wePresent connects to any display by HDMI or VGA and creates a wireless projection in full 1080p resolution. When connected to a local area network, wePresent allows presentations from network computers and supports a passthrough internet connection. In addition, wePresent offers a built-in wireless access point. When enabled, this can provide an additional WiFi signal for guests and meeting participants. Windows. Macbooks. iOS. Android. Chromebook. Connect it all for presentation sharing. With wePresent's smart technology, BYOD meets wireless projection. wePresent allows wireless presentations over any existing network (LAN). This makes it incredibly fast and extremely reliable. It easily integrates into any network environment, insuring your presentations are mirrored at up to 30 frames per second and in full 1080P HD resolution. Equally used as an education technology solution or in corporate and government markets, the WiPG-2000s wireless presentation gateway provides many features that are found in high end rack-mounted audio visual room solutions, but removes the worry and hassle of installing those systems. wePresent is a perfect corporate technology solution that adds wireless capabilities to your conference rooms, training rooms, huddle rooms, and other meeting spaces. As a classroom technology solution, wePresent works well with traditional classrooms as well as flipped classrooms and huddle spaces. ​Upgrade your conference room or classroom with wePresent. With simple, out of the box plug-and-play installation, you'll be wirelessly presenting in minutes. Download the Network Deployment Guide.